These Spicy Chorizo Meatballs with Chipotle Barbecue Glaze are perfect for Super Bowl snacking. They’re spicy, tender, and glistening with saucy goodness. I think we can all agree that Super Bowl is all about the food. I’m sure there are a few people that show up for the game, but I’m willing to bet that most of your guests show up for the endless appetizers and various boozy beverages. Super Bowl is considered a national holiday in my family. We plan menus, send out invites, and request off at work the following Monday. It’s a big deal! Squirrel creates an endless list of “football food” that he then hands off to me with the expectation that I’ll make everything on the list–in his dreams! While I do give in and make a few of the recipes on his very long list, I do like to add a few of my own creations. 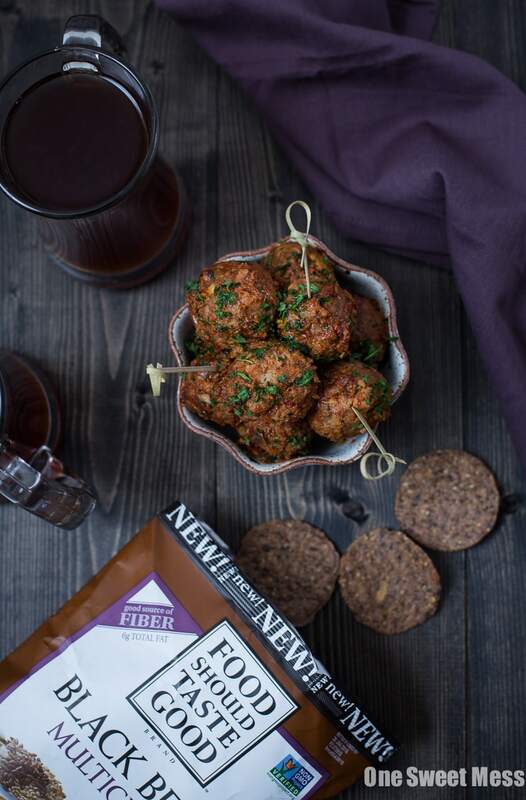 These Spicy Chorizo Meatballs made the list this year, and they’re Squirrel approved! There are so many things I love about these tender little meaty balls, but my favorite has to be the addition of Food Should Taste Good Pinto Bean Multigrain Bean Chips. You read that right. They’re chips made with pinto beans, along with flax seed, sesame seeds, and quinoa. They’re absolutely delicious and supremely crunchy. They also happen to be gluten-free, vegan, and kosher–everybody wins! Instead of sticking with conventional ol’ bread crumbs to bind the meatballs, I used a handful of crushed up Food Should Taste Good Pinto Bean Multigrain Bean Chips instead. The addition of the chips help bind the meatballs while keeping them gluten-free. I used a combination of spicy chorizo sausage and ground beef in this recipe. The chorizo adds bold flavor and a hint of spice, but it also helps keep the meatballs juicy. You know, there’s nothing worse than a dry meatball, am I right? Meatballs require some sort of sauce–it’s the rule. So I whipped up an easy chipotle barbecue glaze to create a sweet and spicy saucy exterior. Since it wouldn’t be a Super Bowl party without a few beers, I’m pairing these smoky meatballs with a lightly-hopped dark lager to balance out the heat. You’re guests will be all over the platter of these meatballs, so you may want to double the batch. You can find Food Should Taste Good products online and at select specialty retailers. For more recipe inspiration, visit them on Facebook, Twitter, Instagram, and Pinterest. These meaty bites are perfect for Super Bowl snacking. They’re spicy, tender, and glistening with a sweet and spicy glaze. Preheat oven to 375 degrees F. Line a baking sheet with parchment paper or aluminum foil that has been lightly greased for easy cleanup. Add the ground beef and chorizo to a large bowl. Add the green pepper, red pepper, onion, and garlic to the bowl of a food processor; pulse until the vegetables are finely chopped. Add the mixture, along with the remaining meatball ingredients, to the bowl with the ground beef and chorizo mixture. Using your hands, mix until the ingredients are thoroughly combined. Measure out heaping 1-tablespoon size balls. Place the balls on the prepared baking sheet, spacing them 1-inch apart. The recipe will make between 24-28 meatballs, give or take. Bake the meatballs for 20 minutes. While the meatballs bake, make the glaze by adding all of the glaze ingredients to a large saucepan; whisk to combine. Cook over medium-low heat until the mixture comes to a gentle bubble. Turn off the heat and toss in the meatballs. Serve immediately or transfer them to a slow cooker set to warm until you’re ready to serve. To achieve perfectly crushed tortilla chips, place the chips in the bowl of a food processor and pulse until they become a fine crumb. Disclosure: Thank you to Food Should Taste Good for sponsoring this post. All opinions are 100% my own. Thank you for supporting my site while I work with brands I use in my kitchen. I adore chorizo so these would go fast around me! I love these smoky flavors! Pass me the whole platter! You mentioned in your post that these are vegan, but you use chorizo (which is an animal product) just wondering if you meant something else. Thanks for the recipe, they look delicious! Hi Candice, the Food Should Taste Good Pinto Bean Chips are vegan, not the meatballs. I was describing the chips when I used the term vegan. Sorry for the confusion. You had me at spicy and chorizo! OMG! These look amazing! Pinned! The only reason I watch football is to eat the food :). I like the flavors in these meatballs: looks great! Forget the game, I want these meatballs! I love that you added chorizo in there and that chipotle sauce too. I love meatballs in every way, shape, and form. 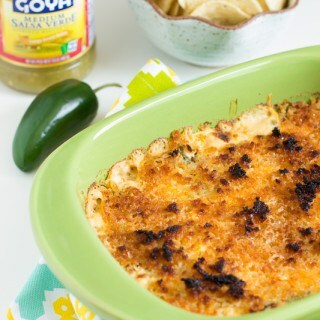 These look so good – that sauce!! !